MOOC stands for Massive Open Online Courses and are aimed at unlimited participation and open access via the web. I found interest in a site offering MOOC courses called Coursera. Coursera was founded in 2012 and as of May, 2015 had over 1000 courses from 119 institutions and over 13 million users (Coursera, 2015). I chose the course called Smartphone Emerging Technologies. I experienced no issues starting the course. As the course began, it prompted me to create an account with a user name and password and after I submitted, the course continued from where it left off. I found the video very engaging as the lesson started off with an overview of the course with the instructor presenting in frame on the left side of the green screen slide as text would populate to his right. The main page of the course listed the different sections or modules to be completed along with sub-topics for each and showed the completion progress as I went along. After the overview, the course syllabus was presented in a text format with hyperlinks for additional reading. The syllabus included prerequisites, course goals and objectives, links to course materials, the course outline, a description of the course elements such as lecture videos, in-video questions, quizzes, readings as well as information on the peer assessed capstone project. Even though the course is free to take for your own personal enrichment, if you wanted to receive credit and proof of completion for college credit or for employer purposes, a verified certificate is available for a fee. In each module I completed, there were assessment questions, a review and a list of references for further reading as an option. This self-paced asynchronous course was designed to be taken by any student, in any place pursuing education in a different-time, different-place (DT-DP) scenario as describe by Dan Coldeway from South Dakota State University (Simonson et al., 2015, p. 9). With the abundant number of institutions that are partnering with Coursera, this asynchronous course could also be a blended or hybrid course for students at the institution’s campus for supplemental learning along with the face-to-face instruction (Simonson et al., 2015, p. 106-107). What I enjoyed most about the course was seeing the instructor in the video presenting. Keegan (1996) noted that distance education must offer “the provision of two-way communication so that the student may benefit from or even initiate dialog” (p. 44). This gave me more of a “connected” feeling to the information being presented and to the instructor that offered a means of communicating with him regarding content or advances in the field what would prompt an update to what was being presented. Overall, I enjoyed the instruction and felt it was a well-designed student-centered course. The choice of these technology tools are taken under consideration based upon Holmberg’s theory of Interaction and Communication. Elements of his theory deals mainly with communication and the motivation the student has toward learning that is impacted by feelings of belonging (Simonson, Smaldino, & Zvacek, 2015). Maslow’s Hierarchy of Needs theory is a five stage model in which the third level contributes to the need of love and belongingness from relationships with friends and family that also involves social, community or religious groups (Atherton, 2013). The motivation of a student is a strong factor toward an effective outcome to the learning. The tools that I have chosen for the pending task I believe will enable the motivation a student in my course will have and promote a positive outcome to the training they will be undertaking. Screencast-o-matic is an online tool from a website that offers a free means of recording what is on your computer’s screen, a webcam or both. The application is easy to use, allows the user to record up to 15 minutes of video in different formats for recipient compatibility and can be uploaded to YouTube for public viewing. To collaborate recordings with team members, all the viewer would need is an Internet connection and access to the YouTube site. The creator of the video would merely need to provide a link to the video they created. In the case there is a team member that does not have access to YouTube, an alternative for screen recording would be a Google extension called Screencastify. This extension is accessed through the Web Store that is found by clicking the Apps button on the Bookmarks bar located in the Chrome browser. After conducting a search for the extension, the user will add it to Chrome and it will appear to the right of the address bar and be associated with their Google account. Video files they create, up to 10 minutes in duration, can record what is on a webpage, the desktop or a webcam and will be saved inside of their Google Drive account or uploaded to YouTube where they would be able to share with other members of their team actual situations that are occurring from their own experiences with the new system. A long-standing method of categorizing the ability of media to convey information is the cone of experience introduced by Edgar Dale (1946) in which he states that real experiences are the foundation for learning (Simonson et al., 2015, p79-80) . Google Docs will be an ideal solution for the team members to use for collaboration on best practices, trouble-shooting issues or updating materials as prescribed by the framework for the approaches to education Dan Coldeway, of South Dakota’s State University indicates at the same time while in different places (ST-DP) or at different times while in different places (DT-DP) (Simonson et al., 2015, p9). The files they collaborate on can be stored inside Google Drive and made available to anyone that needs to access them with the ability to grant access level rights for editing purposes, making comments or view only access. Inside of the LMS system, there is a discussion board feature built in that can assign staff members to a group and allow them to communicate with one another on an ongoing basis. The learning management system under consideration is called Schoology and within the discussion board is the option to share files in a discussion from a third-party application such as Google Drive making it even easier to collaborate with members of the team with documents, videos and images. As an added bonus for ongoing collaboration amongst team members, Google+ also offers a means of communicating with each other while sharing information in a video call using Hangouts, the Google version of Skype. The following links provide some great examples and success stories of people that have used technology tools such as the ones described here for distance learning purposes. Simonson, M., Smaldino, S., & Zvacek, S. (2015). Teaching and learning at a distance: Foundations of distance education. 6th ed. 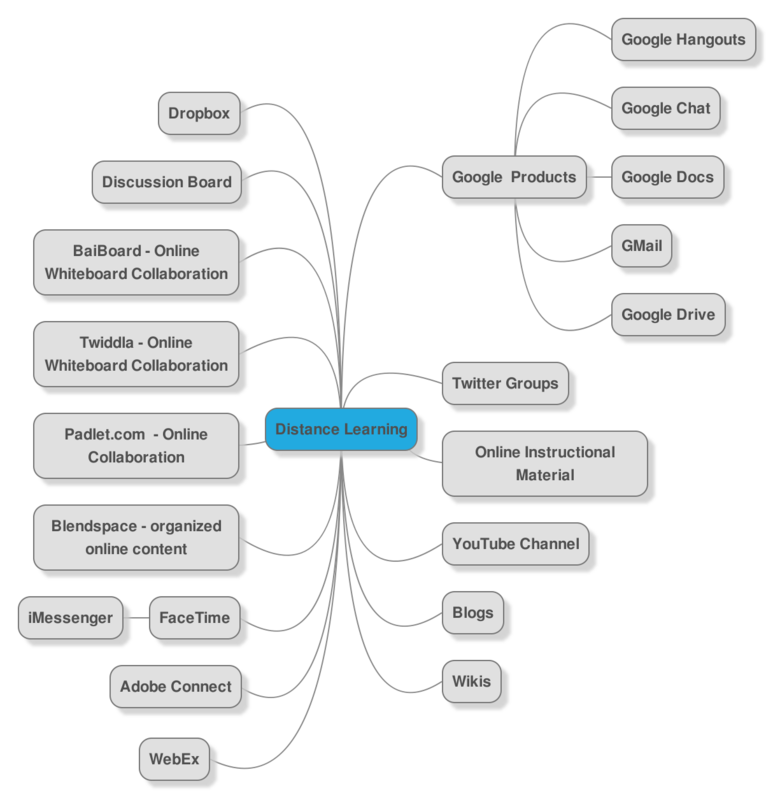 I view distance learning today as an emerging multimedia-rich supportive learning community separated but connected with anytime/anywhere collaborative access to community members and resources. My perspective of distance learning dates back over 18 years ago. As a senior Communication major at the University of Texas at San Antonio, I was a student in the first distance learning class at the Downtown university campus in 1997. All of my classes previous to that were at the main campus with books, highlighters and face-to-face in a classroom with my professor. At the downtown campus, we had reading assignments and a two-way interactive video display so that we could see the lecture from the main campus and the professor could see us for attendance, answer questions and allow us to interact with the other students as needed. As a senior, I was at the cutting edge of what distance learning was for me. In the late 1980s and early 1990s, fiber-optic communication systems, considered the least expensive option for high-quality two-way audio and video, expanded and was made accessible to the field of education (Simonson, Smaldino, & Zvacek, 2015. p.38). Based upon what I was learning about the possible future of distance learning, I saw that system as clunky and expensive, but had a lot of potential toward reaching an audience. Simonson, Smaldino, & Zvacek (2015) describe the four characteristics that distinguish distance education as it being carried out by an institution, but it is not self-study; there is an accessible and convenient geographical separation between students and the teacher; interactive telecommunications connects the learning group with each other and the teacher; lastly, a learning community is established that consist of students, the teacher and instructional resources. Communicating with groups or the professor after the class during that time involved a phone call, email or chat using your “school supported” Hotmail or Instant Messenger account. Learning management systems did not exist. The formats for media and the way we use it today did not exist. This is why technology and the distance learning field is so exciting to me because it is constantly changing. Back then, what was an iPad or a tablet? AltaVista and Yahoo were the “big boy” search engines that everybody used (Wall, 2015). At home, people used a modem to connect to the Internet because access to a high speed connection was too expensive. What that meant was that downloading multimedia content, as limited as it was, took way longer than the average person was willing to wait. When I graduated from college, I did not see distance learning of any sort with the setup I saw at UTSA. Actually from that point, to this current day I have only seen a similar setup of my earlier depiction of distance learning once and it was back in 2009 when I was asked to help a teacher that wanted to set up her classroom to connect with another classroom in China. By chance I happened to be at their campus and I was able to get them connected in time for their distance learning moment. My personal definition of distance learning from an earlier perspective entails having reading materials and other resources to learn from, access to a teacher’s lecture (pre-recorded or live) and a limited means of interaction between the student community and my teacher. Today, my thoughts about distance learning are very different compared to the way I use to think about it. I first saw a system that represented distance learning that I considered clunky and media was very limited. Therefore, the definition of distance learning constantly changes because of the advancement in technology. As technology improves, businesses and innovators are finding better ways to connect a learning community and engage them in media rich environments to maximize retention steeped in the foundations of learning theories that structure models around the different ways people learn. As the technology improves and the framework for engagement is established, professionals in the field will need to learn how to use the new system and teach others, from a user perspective, how to make it work with the subject matter of their given field. Moller, Wellesley and Huett, (2008, p.69) in their three part series regarding The Evolution of Distance Education offer three suggestions to ensure the highest level of faculty performance starting with the need for simple, highly- templated instructional models along with the tools for building learning objects; required training for faculty in the areas of instructional design, teaching and course revision before deploying the course and that faculty concerns regarding the effectiveness of the course need to be addressed. I view distance learning today as an emerging multimedia-rich supportive learning community separated, but connected with anytime/anywhere collaborative access to community members and resources. With the changes we have seen in technology over the years, technology and the capability of learning management systems have evolved with the capability to harness media-rich features that allow for the creative engagement of a learning community. However, as we continue on a path of change, what is there to look forward to? In my distance learning future, I envision a seamless connection between mobile devices. A lecture or course could be seen on any device without regard for compatibility. Perhaps Twitter, TweetDeck and Google Maps will mash up with a video conferencing application and create a collaboration tool for education. I could FaceTime or conference in with my professor or other students in a virtual room to observe, chat, ask questions or collaborate while seeing a bio or location stamp of each person in the room so that I can know the people that I interact with better. Files can be viewed on a device of your choice, marked up with highlights and notes and be ready to view on your PC when you get home. Maybe one day, Google will re-invent the Google Glass project and take group collaboration in a virtual 3D world to the next level. These are just a few changes I see in my distance learning future that has come a long way from being confined by technology to one room with a two-way interactive video display. Simonson, M., Smaldino, S., & Zvacek, S. (2015). Teaching and learning at a distance: Foundations of distance education. Chapter 2, “Definitions, History, and Theories of Distance Education” (pp. 31-40). Moller, L., Foshay, W., & Huett, J. (2008). The evolution of distance education: Implications for instructional design on the potential of the web (Part 2: Higher education). TechTrends, 52(4), 66-70. Plagiarism – I Can Google That!